Updated May 9, 2018: Information about the planned changes has been updated based on the staff presentation at the May 8 Board meeting. The staff proposals were amended by a Board motion directing that one additional gap train be provided on 1 Yonge-University-Spadina in both peak periods starting in September. This will bring the total to 4 AM and 1 PM gap trains. The TTC Board will consider proposals to improve service on their network at its meeting on May 8, 2018. No doubt, there will be many cries of “Huzzah” and tub-thumping pre-election speeches about how Toronto continues to improve its transit service. There is not much new here for those who have been following the 2018 budget process. This is merely the implementation stage of changes that were included in the Council-approved budget earlier this year. The changes will be implemented, for the most part, in fall 2018, and therefore have only a four-month effect on the budget. The costs are projected to be $5 million in 2018 and $15.5m in 2019, offset by revenue from new riding of $2m in 2019. For the 2018 budget year, $3m comes from a Council-approved bump in the TTC’s subsidy, and the remaining $2m from spending redirected from other, unspecified, areas within the TTC. 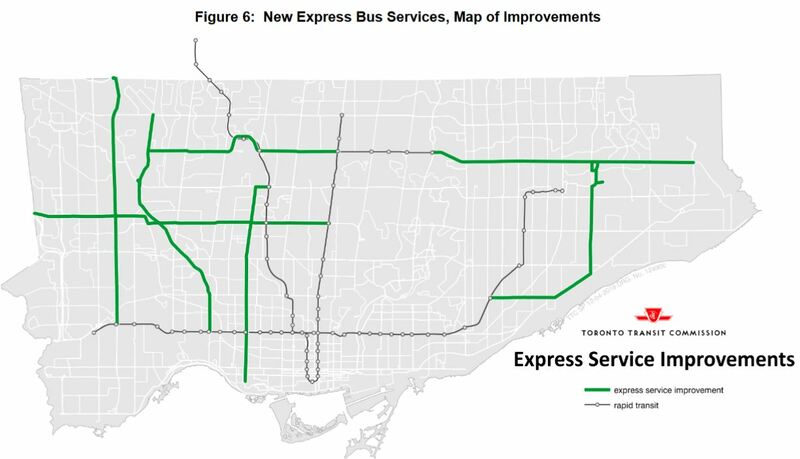 The new riding generated by the changes is projected to be 848,000 in 2019, of which over 60% would come from the new express services. By 2021, this is expected to rise to 1.1 million rides that the TTC would not have seen without the improvements. Many more riders will benefit from less crowded service, at least assuming that the TTC, with adequate funding, stays on top of crowding problems. Stirring all that together means that the net new requirement for funding in the 2019 budget will be $8.5 million.This implies that the “redirection” of funding in the TTC budget is a permanent change, not a one time efficiency or deferral. It is important to contrast this with the cost of opening the Vaughan subway extension ($30m annually) or the fare freeze (a comparable amount). The TTC has used its vehicle shortage as a convenient excuse to avoid service improvements with the argument “even if you gave us the money, we couldn’t run the service” response. In fact, what money the TTC does manage to scrape together is going to underwrite service on the subway extension and politically motivated fare policies. Although there is an intent to reduce crowding, this will only occur on the most badly-overcrowded of routes, and in effect the TTC has made its “standards” worse by only addressing problems on the most badly crowded parts of their system. Moreover, there is still no ongoing reporting mechanism to allow tracking of crowding by route and time period so that the degree to which the TTC fails to achieve its standards is clear for all to see. 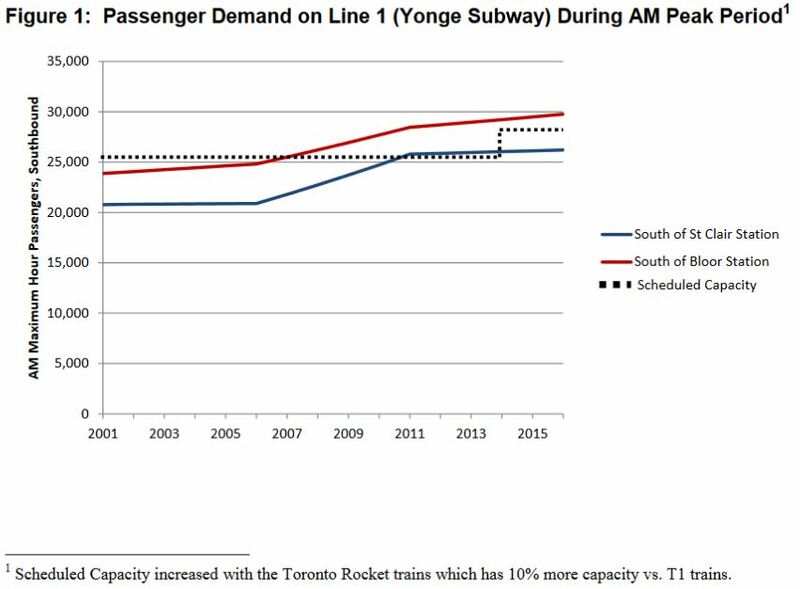 Demand on the Yonge subway south of Bloor Station has been above the level supported by scheduled service, even allowing for the recent conversion to larger trains, for many years. When discussing future system expansion, the added room provided by new trains has always been cited as if it were in the future when in fact this capacity was consumed by overcrowding before the trains were even delivered. A further problem lies with the amount of service actually operated. 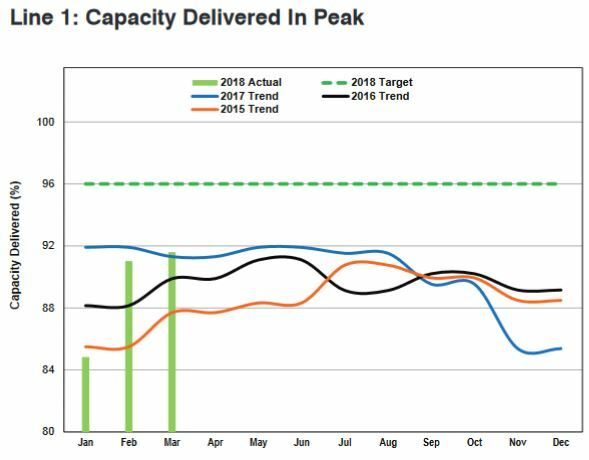 This is routinely below the scheduled level, and so the “capacity” shown above exists only in theory. The actual level of service lies well below this target as shown in this chart from the current CEO’s Report [p 28]. One of the worst problems faced by the TTC is not the occasional major upheaval that blocks service, memorable though those incidents are, but the day-to-day operational problems that produce small delays and gaps. Once a gap forms, it is very difficult to close this up because the affected train will be badly overloaded and will spend excessive time at each station as passengers try to crowd onto trains. A basic tenet of transit planning is that one must not plan based on crush capacity except for brief, emergency situations because packed trains cannot run as frequently and the capacity actually provided goes down. This principle is often lost on penny-pinching politicians for whom “there’s always room on the roof” and “taxpayer dollars” are tightly linked concepts. For many years, the TTC addressed this issue with “gap trains”, a few trains spotted at key locations to be inserted into gaps in the key, peak direction. For example, a crowded platform at Bloor-Yonge can be cleared by a near-empty train originating southbound from Davisville. PM Peak gap trains were stored in the centre track between Union and St. Andrew and inserted as needed onto the line. The table below shows the evolution of service on Line 1 over the past decade. The AM peak headway is limited by the signal system, and has been 2’21” (141 seconds) without change. The PM peak headway is a bit wider so that all service can run through to the northern end of the Spadina line (rather than short turning half of them) with a comparable train requirement to the AM peak. For many years, the summer schedules included a reduction in gap trains, and a slight widening of the PM peak headway. Beginning in 2014, the TTC started to add running time to the schedules so that trains (and more importantly the crews) could stay on time. Up to the point where operations extended north to Vaughan in November 2017), 14 minutes (over 10%) had been added to the round trip time in the AM peak. This is a double-edged sword because if trains do not actually require this, queues form on the approaches to terminals. This phenomenon is common on both Lines 1 and 2 at the end of the peak period when there is a good chance trains will arrive “early” with no platform available. If the running time grows and the headway (space between trains) stays the same, then more trains are required. This was achieved by cutting the gap trains as the table below shows. In the process, the subway lost an important tool for handling minor service disruptions and keeping them from becoming major ones. At the time, this was portrayed by management as making better use of trains that might sit unused on days when there was no gap to fill. That is rather like saying one does not need an umbrella or winter boots because the sun always shines in Toronto. In the May 13, 2018, schedules, the TTC will reintroduce two gap trains in the AM peak on Yonge. One will be located at Davisville and one at Eglinton (in the pocket track north of the station). A third gap train will be added in September. Spare trains are available because the TTC has already increased its fleet in anticipation of shorter headways and increased capacity with Automatic Train Control (ATC). However, the oft-mentioned 1’55” (115 second) headway ATC will allow probably cannot be achieved with the available fleet, especially if provision is made for gap trains. This is an outstanding flaw in the TTC’s fleet planning. There is no announced plan for gap trains for the PM peak, nor for Line 2 Bloor-Danforth, although spare trains are available. Operationally, gap trains for BD would be more difficult to implement because of the limited places where they could be stored for insertion into the service. Updated May 9, 2018: At the Board’s direction and management’s concurrence, two gap trains rather than one will be added in September to the AM peak, and a gap train will be added to the PM peak. Trains running out of service in the evening to Wilson Yard now do so northbound. This has two effects. The train must cross the southbound track possibly delaying through service. A large gap in service to Vaughan can be created. Updated May 9, 2018: The following text has been corrected to reflect the planned operation. This will be changed so that the reduction of service that occurs after the PM peak and through the mid-evening is done southbound from Vaughan. When the new north yard entrance is activated, some of the AM peak service will be able to depart north to Vaughan without conflict between revenue trains and work trains returning to the yard. This track is not yet active, but it is physically in place. This will avoid some of the late service starts that bedevil the Yonge line when trains from Wilson cannot get into service quickly enough to populate the entire route with peak capacity. The TTC has added 10 staff at Bloor-Yonge and St. George stations to assist with crowd control. With the purchase of many new buses and the retirement of the worst of the unreliable old vehicles, the TTC can provide more service without expanding the fleet. This has been a problem for bus operations, albeit on a smaller scale, as with the streetcar fleet where the number of “available” vehicles is somewhat lower than the official fleet size might imply. Moreover, the TTC has acquired property adjacent to Malvern Garage that will allow 40 more vehicles to be housed at that site (net 30 in service). These two benefits will allow more bus service to operate from existing facilities. Still to come is the new garage at McNicoll which, thanks to political interference in the launch of this project, will not open until 2020. A proposal for a ninth bus garage is in the works and will come to the TTC at a date yet to be announced. Peak period improvements have historically been hostage to the TTC’s bus shortage which is complicated by the number of buses required to fill in for streetcars thanks to Bombardier’s delivery delays. Service will be improved on several routes, but this comes with a caveat – only those routes where crowding is already 30% or more above the TTC’s “standards” will be addressed. This, in effect, changes the real standard by setting a limit below which nothing will be done to address service quality. That will keep the budget hawks happy, but it does not relieve the problem standards exist to prevent – the crowding of service to a point where loading delays and packed vehicles are common experiences that annoy riders and deter new ones. Although these improvements will be carried forward as 2019 budget proposals, there is no guarantee that they will survive, nor that any further improvements to achieve the standards will be on the table, let alone be implemented, next year. It is not clear whether the improved service will bring crowding down to the actual TTC standard, or simply below the 30% cutoff line that has been used to filter which route are eligible for improvement. If the latter, then this is a de facto change in standards. TTC staff do not publish route-by-route crowding stats, and so there is no way to know just how pervasive overcrowding might be while the TTC board spends its time in hand-wringing over lost ridership. The result will be that the available fleet will increase from 1,575 to 1,610 in September/October, and to 1,640 in 2019. Part of the added operating cost will be funded through money added to the budget by Council, and part from internal reallocation. In 2019, the expansion to full-year operation will be treated as the annualization of an existing program rather than as a net new service. This is important because funding for existing service has a higher priority than for improvements. This will allow all bus services to be brought within the approved loading standards rather than addressing only the worst cases. New Express services are planned on seven routes, and this change advances plans originally targeted for 2019 to 2021 to late 2018. There are no details on service levels. The remainder will operate only during peak periods, at least initially, with all-day service to be the subject of future reviews. Between the peak period changes to regular service and the new express routes, bus requirements will go up by 49 not including spares. This effectively soaks up the projected fleet growth for 2018. A major issue whenever the TTC talks about service improvements is that Council is loathe to actually provide staff hiring authority to actually run the service. 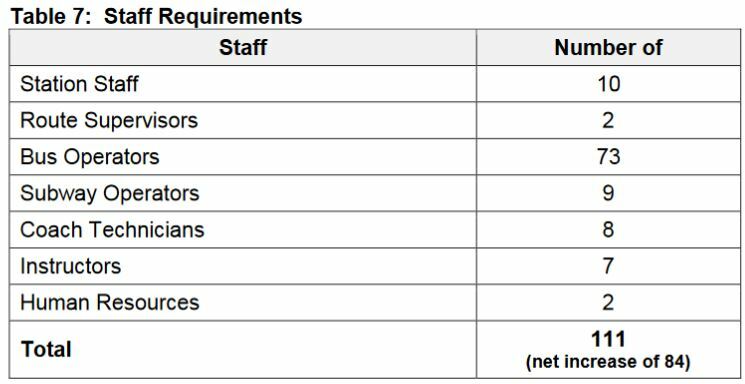 The report includes a table of proposed additional staff. An increase of 27 was approved by Council, but far more are needed to provide all of the new and improved services. A further 84 are requested as shown in the table below. Relying on gap trains in the Eglinton pocket is only going to work until the pocket closes for Eglinton station changes. Is the thinking that by then ATC will have given the necessary additional capacity? One option for quickly responding to conditions at Bloor could be to close and rebuild Rosedale to a similar configuration to Davisville (SB island platform, NB side platform) with a gap train holding. Of course, another option would be to demolish it, build a pocket and then not rebuild. Service reliability on Line 1 – going south from Finch in morning rush – has been reliably terrible since the new stations opened in December. Consistently there are 5 minute gaps between train arrivals, and at least 3 weekdays out of 5 I arrive at the station (before 8am) to find no trains at all and a crowd 3-4 people deep on the platform. Is there any way to mitigate this? Can they keep a train in the pocket north of the tracks to insert into service when this happens? Steve: I have noticed that in general service across Line 1 YUS is now much more ragged since the extension opened, to the point where I have to allow extra time even during the off peak for trips on the reasonable chance that I will encounter a service gap. A problem with the TTC’s measurement of service quality is that short gaps (equivalent to one missing train) do not count against their service quality metric because this does not represent a long enough “delay” or “lateness”. As for storing trains north of Finch, there is a big problem in that only one of the three tracks can be used to store a gap train without fouling up the service. The reason for this is that the signal system enforces a slow order on trains entering a station when the storage track to the north is occupied. This really fouls up turnaround times. Only the centre track of the three does not produce this effect. If I’m reading this right, the 89E WESTON (express route number subject to change) will run express between KEELE STATION and Finch Avenue West, during the rush hours only (initially). The 89 WESTON (local) would continue to run between KEELE STATION and Albion Road. Starting this fall, 2018. Steve: I just copied what is in the report. The map certainly shows the service going up to Finch. For gap trains on Line 2, wouldn’t Bay Lower be a logical spot to park a train? If that was the used, along w/centre track west of Chester, and maybe Keele/Vincent yard in the west, wouldn’t allow for adequate coverage? Steve: These would certainly work, although the lower Bay train would have to be positioned before the peak starts given the need to bring it north on University. Keele/Vincent could be a bit far west, but equally one could argue for a gap train originating at Greenwood Yard. So Steve, will the Dufferin and Markham RD Rocket buses be running 7 days a week or just Mon-Fri? Are all the off peak improvements just for Mon-Fri or 7 days a week? Steve: If you look at the table on the last two pages of the report linked from my article, you can see the hours of service for all of the improvements. The new express routes will not run on weekends. I found the service summary page with all the service period increase details literally 2 minutes after I commented on here. Sorry about that. I’m surprised that the Dufferin Rocket is not operating weekends. I mean the 29 bus is always crush loaded on Saturdays. Who knows, they might increase the express service to 7 days a week eventually? Steve: I believe that is the plan, but there are no specifics about when. Also do you happen to know when the 199 will see it’s route extended from Finch Stn to Finch West Station all week? Is it in the works? Steve: I have not heard anything about this, but still to come is an update on the Service Standards and a review of demand on the system as a whole. The roadblock has always been the limitation of operating subsidy and the TTC’s focus on squeezing money out of its operating budget. With the coming elections, it’s hard to know what the situation will be in 2019. The CEO Report notes that the 75 Sherbourne bus is among the top 6 for short turns. Though I am not a daily user I use the 75 quite often and have never been short-turned. Where do these happen? Steve: Yes, that is a rather strange list. Hey Joseph, the TTC’s Express Bus Network stated that by 2021 the 199B Finch West to Scarborough Ctr branch would receive service during the weekends only during the early morning and afternoon. The 199A branch would become a route with all-day service by 2021. Steve: Given that the Express Network implementation has been brought forward a few years, the timelines may change, but at least it’s in the list. One problem with getting any express bus service is the current traffic congestion. For any possible Weston Road express service, there are bottlenecks at intersections, especially during the rush hours along Weston Road between Annette Street to the south and Black Creek Drive to the north. Some relief may come with an connection with Keele Street and Gunns Road, as part of the “SmartTrack” project, along with other “improvements”. Miss the Old Weston Road bridge that went north from the Dundas/Annette/Dupont intersection. I’m surprised that the 47 Lansdowne bus isn’t included for improvements. Every morning, it is standing room only north of Bloor to the Castlefield Design District and, similarly, south to Lansdowne Station in the afternoon peak. Without resolving the end-station (e.g. Finch Station) efficiency issue, adding new trains does not mean anything to Line 1. All the trains are simply slowed down and lined up at the end-stations. It could make the numbers better on paper. But, the real capacity does not improve much. Steve: The added trains would only be used to fill gaps in service. This does not change the scheduled capacity, but does resolve problems where platforms fill with waiting passengers because there is a wider than normal gap in service. For example, an empty train originating at Davisville generally clears all waiting passengers down to and including Bloor Station. This benefits not just the waiting passengers, but also the trains behind the gap which do not have to deal with a backlog of demand. The person giving the answer works in a Crosstown Community Relations office who is probably relaying an answer from another office. I am wondering whether this answer conflicts with what Brad Ross said. I thought that extending the Eglinton platforms was a Metrolinx task; Metrolinx is suggesting it is a TTC task. To extend the platform, there is only a few metres between the north end to the platform to the points of the mainline branch to the pocket track. I’m not sure whether there is enough room even for an extra staircase at the north end assuming the pocket track stays in place. Traffic through the Junction (Dundas and Keele) has been bad ever since that bridge was closed. It has only gotten worse in recent years. It should have been replaced but they cheaped out. They missed the boat (train?) when Canadian National Railway closed their West Toronto freight yard and CN Express truck terminal north and east of St.Clair and Weston Road. The City should have used that opportunity to finally extend Keele Street south from Rogers Road to Weston Rd/Keele St. just north of St.Clair. This was dotted lines on road maps for decades! Missed another opportunity to ease congestion when the UP Express came along and the century-old Diamond crossing wherein the north-south and east-west tracks were separated. They could have dug it wider and included a road alongside the tracks. Not sure how much relief there will be with Gunns Road extended east from Weston Rd underneath all the tracks towards Old Weston Rd./St.Clair past the new GO station. Old Weston Rd to be widened south across St.Clair to Davenport and end there. Big deal! Davenport is just one lane each way east of Old Weston Rd and then traffic still has to find it way east and south. Nothing to relieve major congestion at Keele and Dundas. I, too, miss the Old Weston road bridge. It was a beautiful old truss, and a great train watching spot. It’s hard to imagine it making much difference with today’s huge rush hour traffic volumes in that area. Rebuilding it to four lanes would have resulted in traffic being funneled into a two lane residential neighbourhood. I think that was the main reason that the city fathers didn’t replace it. Maybe something creative can be done with a Dundas Streetcar [re]extension and an Annette Rocket. Today, I found the document “Eglinton Crosstown LRT Interchange Stations – Final Designs” (dated March 20, 2018) on the TTC site which says that the Line 1 platform will be moved 24 metres north instead of 70 metres. It makes no mention of the pocket track. The switch to the pocket track is only a few metres north of the existing platform, suggesting that the TTC will have to move that track north as well to keep it operational. I have noticed that the pocket track is also used to take trains out of service at the end of the AM rush. The document is by the TTC but contains many illustrations prepared by Metrolinx. Steve: After I saw that document originally and because of questions on this site, I wrote to Brad Ross asking about the pocket track and the signal room which is north of the platform. The responses I got back suggested that the pocket may survive but only be used for work trains (which are shorter than regular trains). The signal room will probably have to be relocated, and that work would, I expect, be done as part of the conversion to ATC for that section of the line in 2019. 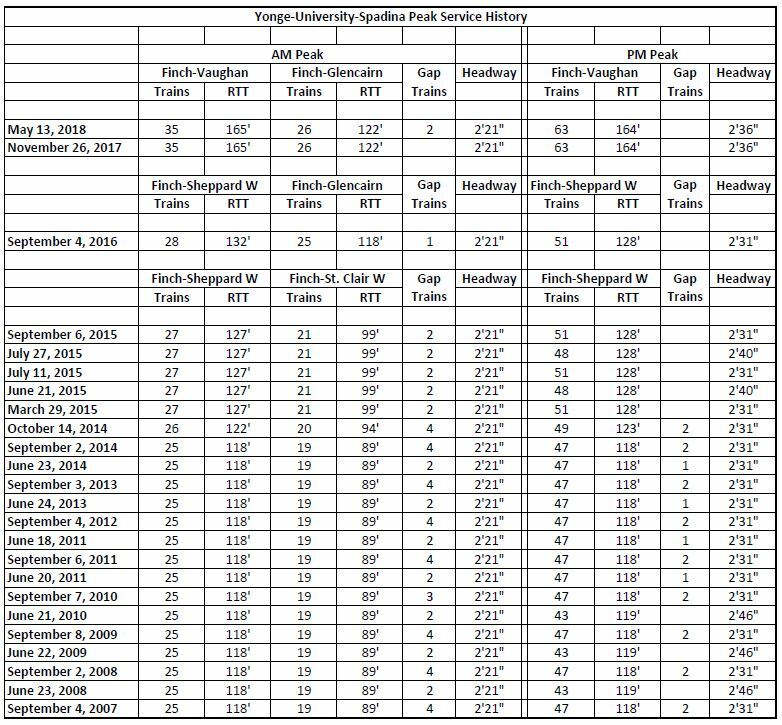 I am going to chase the question of the pocket track configuration again given the importance of having a slot for gap trains.